Planet Seen By Hubble Space Telescope - Solar System Planets And Moons Section. Hubble Space Telescope Could Be Seeing a Planet. Hubble Space Telescope Sees Planet. 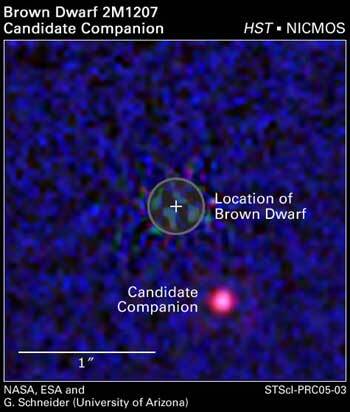 The Hubble Space Telescope is helping to confirm the potential discovery of an extrasolar planet; the companion of a dim brown dwarf located 225 light-years away. The object was first discovered in April 2004 by Astronomers using the European Southern Observatory's Very Large Telescope. Astronomers think it might be a 5 Jupiter-mass planet because it's glowing too dimly to be a star. The planet and its parent star are 130% of the distance between Pluto and the Sun, so it takes 2,500 years to make one orbit. If Hubble confirms the object, this could become the first extrasolar planet ever imaged directly.